Eau Carafe is a part of the successful Charcoal Water Filter Range by Black+Blum, which uses Binchotan active charcoal to filter water. It has been used by the Japanese for over 500 years and will make your tap water taste great. This range was created to encourage people to stop buying expensive bottled water and adding to the continuing single-use plastic global environmental problem. Eau Carafe is an elegant, handblown glass carafe. Holding just over 1 litre, it is an ideal size for your fridge door but also looks beautiful on the dinner table. Eau Carafe has the same iconic shape as the original Eau Good making it lovely to hold and pour from. 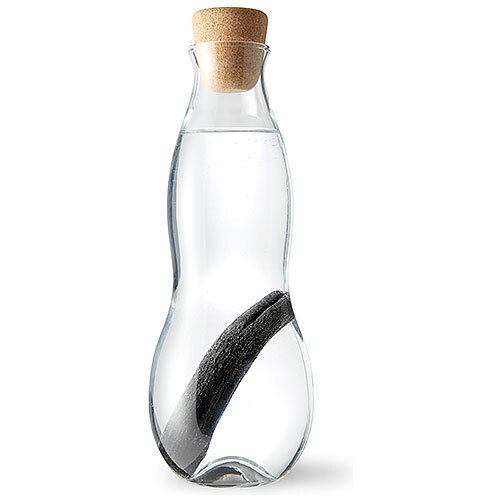 The Eau Carafe comes with a Charcoal Filter. Black+Blum Eau Carafe Glass - 1.1 Litre with Charcoal Filter. Dishwasher safe except the cork - advise to wash by hand with hot soapy water and a bottle brush to prolong product life. If you are using the charcoal filter, fill the glass up once a day, then it should last three months. You are then able to recharge it by boiling it in water for ten minutes and then leaving to dry in sunlight. You should be able to keep recharging it for a further three months. Below are reviews of Black+Blum Eau Carafe Glass - 1.1 Litre by bodykind customers. If you have tried this product we'd love to hear what you think so please leave a review. We've got a couple of these. Great for keeping in the fridge & great clean water. The glass is really thick as well so doesn't smash.